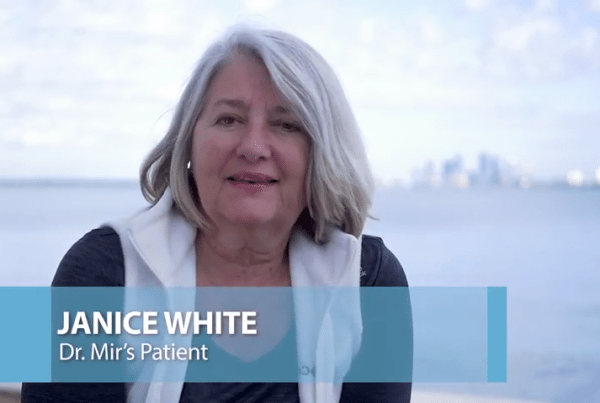 Since 1989, Florida Orthopaedic Institute surgeons have helped thousands of patients get back on their feet with Tampa Bay’s most advanced orthopedic lower extremity service. Knowledgeable and experienced physicians, therapists and nurses work in concert to cover the total spectrum of foot and ankle musculoskeletal care. Our Foot, Ankle & Lower Leg Center includes diagnostic imaging, physical therapy, on-site MRI, and surgical treatments. Whether tendon, ligament, bone injuries, arthritis, or acute/chronic conditions, Florida Orthopaedic Institute surgeons are fellowship trained and have extensive knowledge in the management of all conditions affecting this region of the body. Thankfully, many of these problems require conservative management before requiring surgery. Shoe modifications, bracing, physical therapy, and medications are only a part of what is offered. When surgery is indicated, the operative experience of the surgeon is critical. With the largest combined experience in Florida, the Florida Orthopaedic Institute team has performed tens of thousands of these procedures including flat foot corrections, ankle and subtalar fusions, midfoot osteotomies, bunion surgery, soft tissue reconstructions, as well as fracture reconstruction. An ankle fracture, also known as a broken ankle, is when one or more of the bones that make up the ankle joint are broken. Ankle fractures can range from a simple break in one bone to several fractures. The more bones that are broken, the more unstable the ankle becomes. Podiatrist or an Orthopaedic Physician? Orthopedic surgeons, podiatrists, primary care physicians, and physical therapists all evaluate and treat conditions of the feet. How do you know who to choose for your foot and ankle problems? 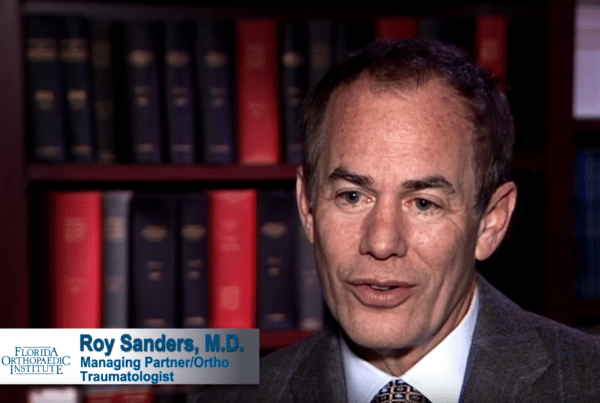 Orthopaedic Physician or a Podiatrist? 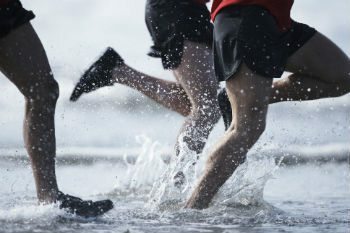 If you participate in activities that involve running and jumping, you can get a condition in which the ball of your foot becomes painful and inflamed. This is called metatarsalgia. It is also caused by foot deformities and shoes that are ill-fitting. Symptoms of metatarsalgia can include sharp, aching or burning pain in the ball of your foot, pain that worsens when you stand, run, flex your feet or walk, sharp or shooting pain, numbness, or tingling in your toes or the feeling of having a pebble in your shoe. Achilles tendinitis occurs when the large tendon that runs down the back of your lower leg (the Achilles tendon), becomes irritated and inflamed. Achilles Calcific Insertional Tendinopathy (also known as Insertional Achilles Tendinitis) affects the lower portion of the heel, where the tendon attaches to the heel bone. When there is repetitive stress to the tendon, damaged tendon fibers can harden (calcify) and extra bone growth (bone spurs) can be formed causing Achilles Calcific Insertional Tendinopathy. Calcaneal fractures are break of the heel bone (calcaneus). They usually occur from a motor vehicle collision or when a person lands on their feet following a fall from a height. The heel bone, also known as the calcaneus, is the largest of the tarsal bones and articulates with the cuboid bone anteriorly and the talus bone superiorly. It is responsible for transmitting the majority of the body’s weight from the talus bone to the ground. Calcaneal fractures are categorized as intra-articular or extra-articular based on the subtalar joint involvement. Most calcaneal fractures are intraarticular (also spelled as intra-articular) resulting from high-energy trauma. Intraarticular fractures involve the posterior talar articular facet of the calcaneus. Achilles tendonitis, also called tendinitis of the heel, is an injury of the Achilles tendon which connects the calf muscle to the heel bone. It is a common injury with more that 200,000 US cases every year. It is spelled as both tendonitis and tendinitis. The Achilles tendon is the largest tendon in the body, connecting your calf muscles to your heel bone. It is used when you walk, run, climb stairs, jump, and stand on your tip toes. Achilles tendon can withstand great stresses from running and jumping, but it is also prone to tendinitis from overuse and degeneration. Achilles tendonitis is common in runners and middle-aged people who play sports only on the weekends with key symptoms of heel pain and tenderness. Charcot Joint (also known as Charcot foot) is the condition of neuropathic arthropathy or neuropathic osteoarthropathy. It is named after Jean-Martin Charcot, French neurologist and professor of anatomical pathology. Charcot Joint is progressive degeneration of a weight bearing foot joint and includes bone destruction, bone resorption, and eventual deformity. Charcot Joint affects some diabetic patients with loss of sensation (peripheral neuropathy) after several years. Peripheral neuropathy affects the sensory nervous system to the farther, points of the body (like the feet) causing loss of feeling or numbness. Diabetic neuropathy also includes the involuntary nervous system which controls regulation of blood vessels and skin moisture. It can result in increased blood flow to the limb, contributing to swelling and osteoporosis of the bones as the Charcot Joint condition progresses. 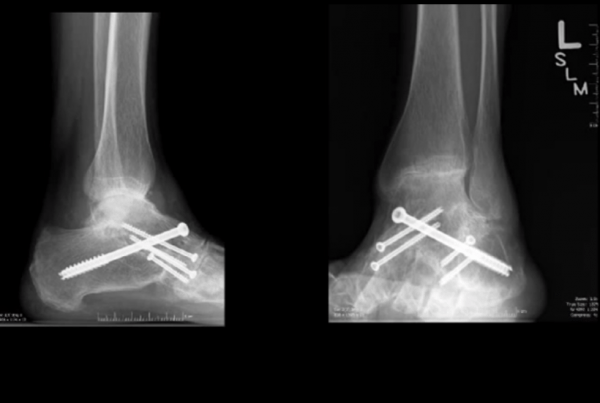 When the cartilage in the ankle joint becomes damaged from severe arthritis (or from a previous injury or ankle fracture), ankle fusion is used to permanently join the damaged bones, preventing them from rubbing against each another and causing pain. The ankle joint consists of the shin bones (tibia and fibula) and the ankle bone (talus). Where these bones meet, they are covered by a smooth cartilage lining in the joint that allows you to move your ankle freely. As the cartilage wears, the space in the joint gradually narrows, causing bone-on-bone contact, resulting in pain and stiffness. One of the most common causes of heel pain, Plantar Fasciitis is an inflammation of the thick band of tissue (plantar fascia) that runs across the bottom of your foot connecting your heel bone to your toes. Active men between the ages of 40-70 are most affected. Improper footwear (not enough arch support), running on uneven surfaces, long-distance running, and downhill running are contributing factors. Arch problems in the foot (flat feet or high arches) and sudden weight gain or obesity can be causes. People with Plantar Fasciitis commonly get a stabbing pain with their first steps in the morning. As they get up and move, the pain normally decreases, sometimes returning after long periods of standing or sitting. Learn more about the symptoms and treatments of Plantar Fasciitis. If your toes are curled under or crooked, you may have hammer, mallet, or claw toe. When the muscles, tendons, or ligaments that surround your toe aren’t balanced, it causes the toes to bend in an odd position. One of the main causes of hammer, mallet and claw toes is wearing shoes that don’t fit properly or high heels. Tight fitting shoes crowd your toes and force them into a bent position. Then the muscles tighten and shorten. Mallet, hammer, and claw toes are some of the most common toe problems. Ankle sprains happen when the ligaments that support the ankle stretch beyond their limits and tear. They are a common injury that can occur among people of all ages. Depending upon how much damage there is to the ligaments, ankle sprains can range from mild to severe. While most minor sprains heal with treatments like rest and ice, be sure to see a doctor if your ankle is very swollen, painful to walk on or if you are having trouble putting weight on it. To learn more about the causes, symptoms, and treatments for ankle sprains, click below. A Cheilectomy is an operation to remove a bony lump on the top of the main joint of the big toe. Also known as hallux rigidus, this condition is usually caused by arthritis of the great toe. Cheilectomies are performed because the bony lump is causing pain by pressing on your shoes. It is also used as a treatment for early arthritis of the big toe if the joint is not yet badly affected. Some people have both issues. Unfortunately, this is a rather common problem and requires careful management to maintain motion while minimizing pain. The first line of treatment remains oral medications, but stem cell injections are frequently used by the staff to minimize the inflammation within the ankle that causes the pain. When this is not effective, arthroscopy may be used remove irritating tissue. These minimally invasive procedures are designed to prevent the need for an open procedure. However, when arthritic pain and deformity prevents patients from maintaining a normal lifestyle, either a fusion or an ankle replacement is required. 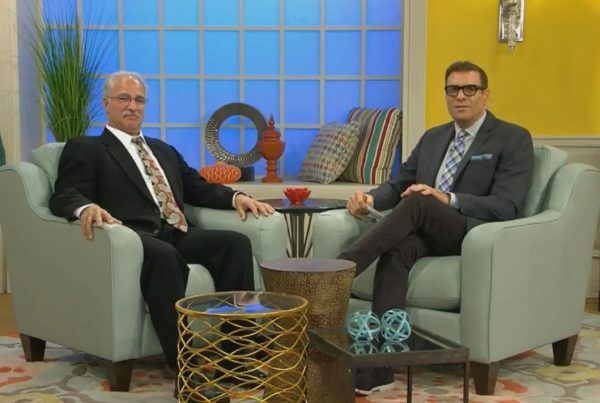 In 1995, the Agility® total ankle prosthesis became available in the U.S. Florida Orthopaedic Institute was the third center in the country to implant this device, with our surgeons involved in design, teaching, and evaluation of the implant. Later that year a European ankle known as the S.T.A.R.® was released, and Florida Orthopaedic surgeons were involved in the first trial of that prosthesis in the U.S. Since that time, Florida Orthopaedic Institute surgeons (all trained on total ankle replacements) have performed hundreds of replacements. 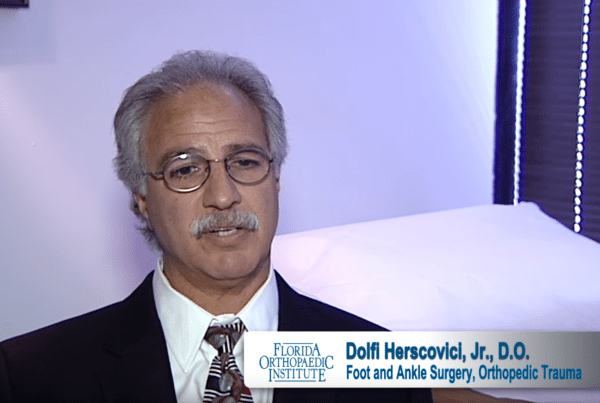 With over 20 years of experience, the foot and ankle surgeons of Florida Orthopaedic Institute remain leaders in the field. Neuromas are a thickening of the tissue around a nerve leading to the toes. It is a fairly common problem, with over 200,000 U.S. cases every year and is more common in women than men. The most common neuroma in the foot is Morton’s neuroma, sometimes referred to as an intermetatarsal neuroma. Morton’s neuroma occurs between the third and fourth toes. Neuroma can be caused by pressure or injury, such as use of high heels or from running. Symptoms can include sharp, burning pain, numbness in the ball of the foot or toes, pins and needles or a reduced sensation of touch. Sometimes it can feel like a lump in the sole of the foot, the sensation of walking on a marble, a pebble in a shoe or a fold in a sock. 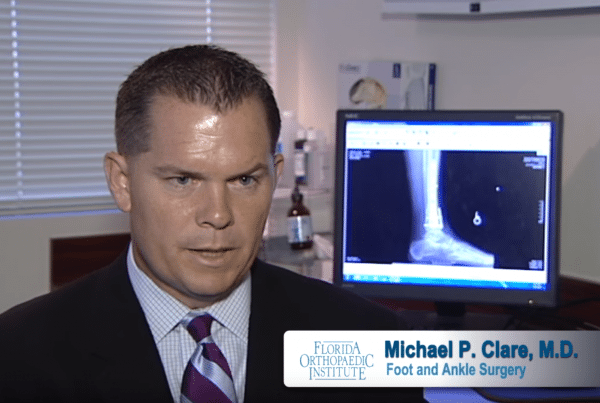 Because of the combined expertise of the Florida Orthopaedic Institute foot and ankle surgeons, as well as their national reputation, patients are referred not only locally, but from all over the country. Many of the referrals are patients with significant post-surgical complications including infections, failed joint replacements, poorly positioned fusions, and non-healed fractures. These patients are sent to the Center for definitive solutions to their problems, and in most cases our surgeons are able to improve their lives. This ability to solve complex problems and help patients is the driving force behind maintaining the high quality of care offered, and why Florida Orthopaedic Institute is a regional and national referral center. 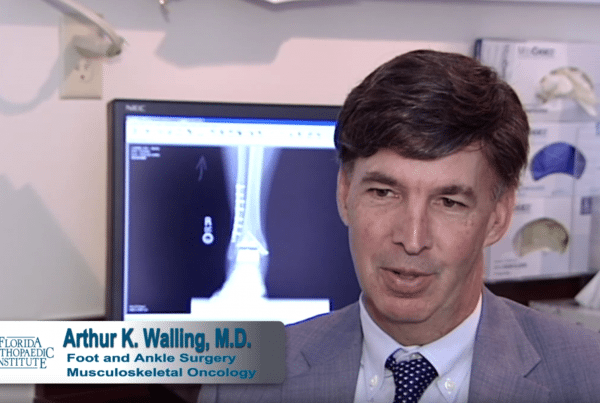 See how Dr. Arthur Walling utilized improved Ankle Replacement technology to help a Mt. Dora woman return to her active lifestyle.